The prologue to The Darjeeling Limited, Hotel Chevalier, sets up the emotional state of Jason Schwartzmans Jack. That this short film will only be shown in select screenings and online is a shame. Sure, it works as a standalone meditation on the crushing difficulty in fully letting go of an unhealthy relationship but to see Darjeeling without having seen Hotel will effectively cripple one of its funniest jokes. Attention will inevitably rest on Natalie Portmans very literally naked performance but its Schwartzmans wounded stare and bitter wit that imbues Hotel Chevalier with resonant intimacy. The Darjeeling Limited commences with a cinematic passing of the torch. Through a vibrant Indian market teeming with beauty, the camera finds a face extremely familiar to Wes Anderson regulars. The familiar old man is running to catch a train when Adrian Brodys gangly frame pushes past him, catching hold of the caboose railing as the train speeds off, thus signifying this will be a young mans journey. 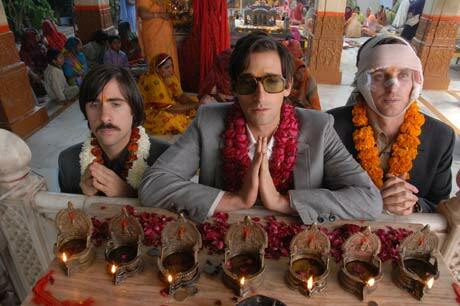 Brody plays Peter, one of three brothers, along with Francis (Owen Wilson) and Jack (Schwartzman), who agree to meet in India for a spiritual adventure to reconnect with each other. Francis has the whole trip meticulously planned out to achieve maximum enlightenment while maintaining their train schedule. Such Western regimenting is obviously a poor path to spirituality and soon the brothers are drowning themselves in cough syrup and muscle relaxants, alternately squabbling amongst themselves and wallowing in self-pity. Expectedly, the trip goes awry through the brothers damaging lack of self-control and its only once theyve abandoned expectations that the true spiritual journey begins.